The phrase… “good things come in small packages”… is an appropriate adage to describe the gem known as NorthShore Villas. 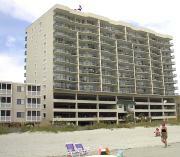 Only small in overall number of condominium units (57), but large on luxury and attention to detail, this oceanfront condominium building from Drake Development Company USA is located in a quieter section of North Myrtle Beach and was completed in August of 2000. Standard features in the roomy 3 and 4 bedroom villas include large private oceanfront balconies; sliding glass doors in the master bedroom and living room; Drakes’ signature open kitchen design; elegant chair railings in the hallways; cable TV outlets and telephone jacks in all bedrooms, as well as a master bath with whirlpool garden tub, separate shower and double lavatories. The 4 bedroom, 3 bath penthouse villas of over 2,200 square feet, are beautifully furnished with sable-stone countertops, side-by-side refrigerator, radiant cook-top stove and a separate wet bar with ice maker. Outside amenities feature a heated ocean-side pool, kiddie pool, whirlpool spa and lazy river. An oceanfront stairway leads to the unique exercise and fitness room, which is situated overlooking the Atlantic Ocean. Site developed by Deborah S. Chaney.